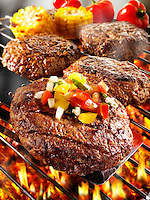 Barbecue Burger food pictures, photos & images. 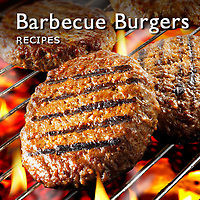 The burgers are being flame grilled on a barbecue. 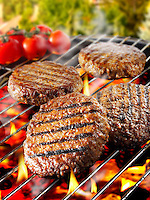 Burgers are perennial favourite on the barbecue. 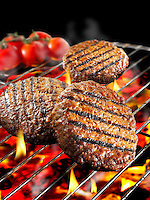 The ground meat patties are made to be flame grilled and are perfect on the barbecue as they do not fall apart. 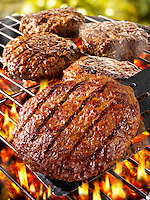 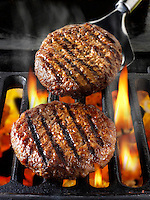 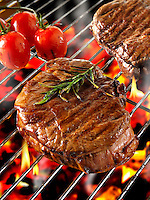 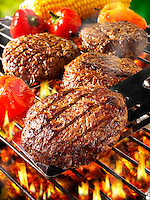 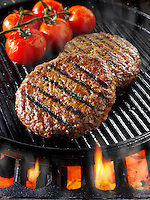 Flavour can be added simply to barbecued burgers by adding smoking woods to the hot coals. 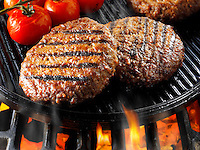 Oak, hickory and alder add a smoky flavour to the burger and this type of cooking is very popular in the USA.